To Stop… Or Not To Stop? That is the question. And only the weather has the answer. Our goal was to make it to Georgetown. Our time on the Exuma Bank is short as we must make the jump out into Exuma Sound (AKA The Big Water) to get there. Our resistance to getting beat up by the ocean is strong and so we wait. It looked as if we would have two days before our weather window and we needed to position ourselves near one of the many “cuts” that offer safe passage from the banks to the sound. We studied all options, read everything we could find about the cuts between the cays as well as available nearby anchorages for staging. We were ready to leave Black Point. If we play our cards right, we could spend two nights at Great Guana Cay and still get out through Galliot Cut with plenty of time to make a daylight hop down to Great Exuma. The winds were still blowing pretty briskly but Bruce considered that a GOOD thing. He wanted to try raising the storm sail just to see if he could. 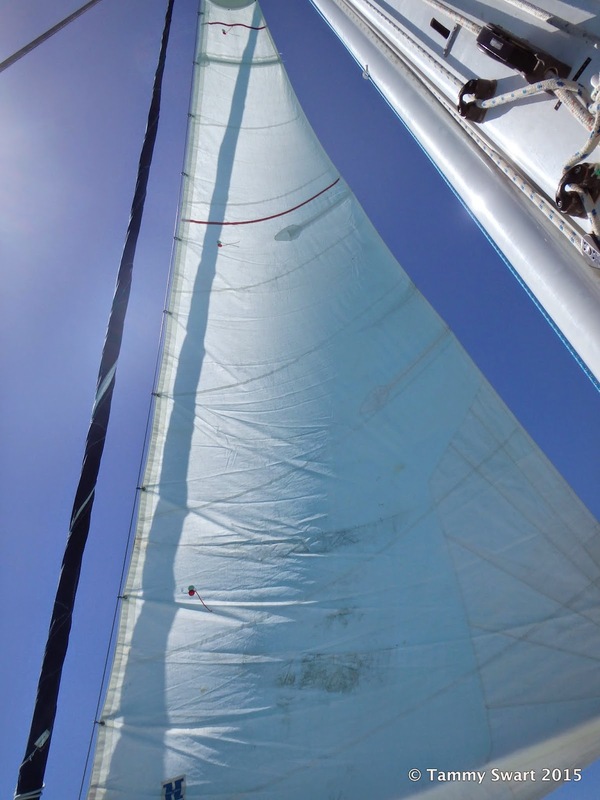 It’s a ratty old small, hanked on sail (that means it doesn’t go in the sail track or roll on the furler), that we’ve never used before. We beached the dinghy on the sand just near Oven Rock and walked along the sandstone shelf beach to find a rock cairn signifying the entrance to the trail. Bruce reverently placed his stone on the top and we began our trek. The path wasn’t always obvious, but it was well worn enough that we didn’t get lost. The tricky forks were marked by some previous traveler with extra hard-hats on hand, with… hardhats. 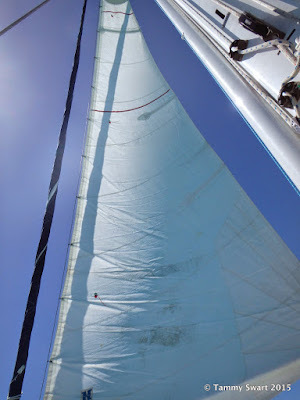 We climbed to near the highest point of the island and could look out over the anchorage where our boat lie peacefully. With a turn of the head head the sparkling variegated blues and greens of the Atlantic sprawled at our feet. We took the last turn and very nearly missed the cave entrance. Had it not been for that last hardhat, there is no way we would have ever known there was a cave there. Until you climb through the brush to see this! We crawled down through the brush and the yawning mouth of the cave became more evident. I could smell the “cave air” expressed from the wide low opening in the rocky earth. I was so excited! I couldn’t believe that a place like this was just here… waiting for schmucks like us to come and check it out. No ticket to buy, no rangers and no roped off areas. Of course all the caves I’ve visited in my life have instilled the need to protect this treasure. 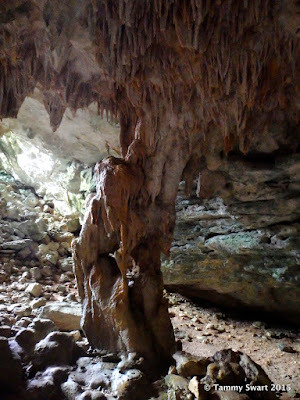 We knew not to touch the life stalagmites and risk damaging them with the oils on our skin. 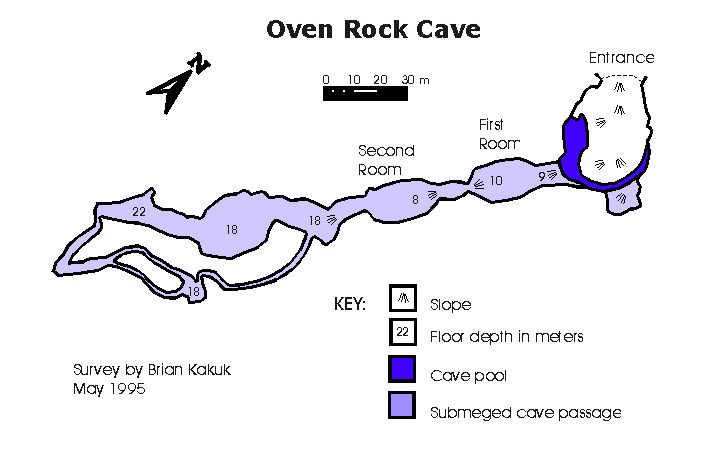 We left our bags outside the cave and crept down the rocky slope into the main chamber. My eyes scanned the ceiling in search of anything that looked like a bat. Finding none, I relaxed and stared around in wonder. There were stalactites hanging from the ceiling, some in lines that, in my mind signified cracks in the ceiling. Hmmm. I called upon my PSB to make sure that today was NOT the day that this cave decided to… well, cave in… and pushed the thought from my mind. Our footsteps followed the obvious route down to the lowest level of the cave where there was a still pool reflecting the rock formations stretching towards the water. It was so calm. We were so red-cheeked hot, it was tempting to get in and swim, but I worried about the possibility of strange, prehistoric cave-dwelling critters that might crawl into my ears and eat my brain. I know, too many episodes of Star Trek when I was a child. But this place was right out of an old Hollywood Movie set and I could imagine Spock climbing down from the rocks above and maybe James T. Kirk silhouetted in the entrance. I found a map of this cave on the internet that showed it continuing far beyond what we see… under water. Cave divers can have it. No way would I EVER submerge myself in the water far beneath tons of rock. Just thinking about it made me nervous so I left the pool and climbed up to a rocky gallery seat where we could rest and quietly survey all this at our feet. We grabbed our stuff and backtracked to the main trail and continued on to the Atlantic side of the island in hopes of getting in a brief swim. What we found was, again, out of some old movie. A perfect curve of beach protected by a reef to block out the pounding surf was our reward. It was just a little pocket in time and space that provided us with a place to splash around and cool off. We found a branch to hold our clothes (I had my swimsuit on but Bruce… well, no-can-talk-about). Bruce donned his mask and snorkel and hit the water. He takes every opportunity to get in a good swim… while I… I love to lie back and float and meditate. We drip dried while eating a sparse picnic lunch and then returned to the trail. Funny how it seems to be a shorter distance back than it had been getting here. Still the views were breathtaking. We tumbled down onto the beach and back to the dinghy, wishing we had more time to poke around on the rocky shelf… but there was still some talk of leaving today and finding an anchorage closer to Galliot Cut. During the dinghy ride to the boat, we looked over at the patch of coral heads just waiting to be explored… and the white beach just beyond the boat that needed walking upon… and decided that another night here wouldn’t kill us. 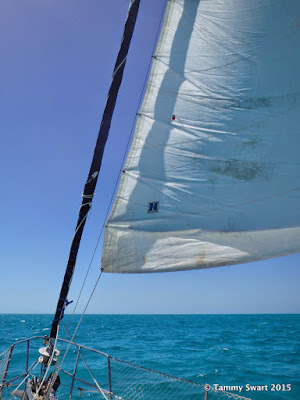 We returned quickly to the boat to change our clothes and grab our snorkel gear, then set our course to the coral heads and dropped our dinghy anchor just near enough. With snorkel, fins and masks on, we plunged in and set to making sure our dinghy anchor was secure. It was not. Bruce, with a little bit of urging from me… took the anchor and placed it so that we didn’t have to worry about losing the dink, then we swam for the coral heads. We swam from one rock to the next until there were no more, then we backtracked to the dinghy and hefted our shivering selves aboard. The sun was beginning it’s descent but it was still warm as we turned next to that aforementioned white sand beach. It was a long stretch of gorgeous and we walked all the way to the end. We found round white shells that were shiny as if polished and picked up a handful. Funny how you find batches of shells as if they travel in colonies. Could this be? On the way back to the dinghy, I took a dip in the shallow trough of water between the beach and the rock to cool off. Suddenly a black hulk loomed towards me from the way we had come. Bruce saw it first, but it didn’t take me long to get out of it’s way! It was a huge ray just cruising the shallows… I got some pictures and some video as it passed me, then I ran up the beach to get ahead of it for another picture pass. This I did several times until I figured “ you only need SO many ray pics…” and we went on our way. So many times today we’ve mentally pinched ourselves and marveled at how awesome (it’s the only word that fits) this life is. So let’s just recap the day. In ONE day… we saw a beautiful sunrise, streaked across crystal waters with hair flying in the dink, beached upon a deserted island, braved being lost and never found while climbing rocky paths inside an otherworldly cave. Explored said cave risking life and limb from unknown dangers not common to ordinary man, discovered pristine beaches and swam in the protected waters alone, hiked now familiar pathways and swam over an open aquarium. We strolled lonely beaches and found sea treasures, then swam with a ray… oh, and don’t forget the obligatory sunset.